Fouled Anchor • Navy Chief, Navy Pride! Fouled Anchor: The fouled anchor is a Naval symbol of an anchor with a chain wrapped around it or "fouled" (an "unfouled anchor" would be one that is not entangled in its chain). The fouled anchor has long been the symbol of the Chief Petty Officer. In terms of the Chief, the fouled anchor symbolizes the trials and tribulations that every Chief Petty Officer must endure on a daily basis. 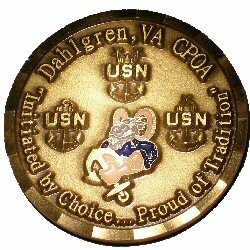 The "USN" stands for Unity, Service and Navigation, symbolizing the Unity of the CPO Mess, the undaunted Service to God and country of each and every Chief Petty Officer and the Navigation that the Chief is expected to provide to each Sailor, each Navy ship and the entire Navy. The fouled anchor (line (rope) or chain wrapped around anchor) as a naval insignia got its start as the seal of the Lord Howard of Effingham. Lord Howard was the Lord High Admiral of England at the time of the defeat of the Spanish Armada in 1588. During this period the personal seal of a great officer of state was adopted as the seal of his office. The fouled anchor still remains the official seal of the Lord High Admiral of Great Britain. When this office became part of the present Board of Admiralty, the seal was retained--on buttons, official seals, pharmacy online, and cap badges. The U.S. Navy's adoption of this symbol and many other customs can be directly attributed to the influence of British Naval tradition. The fouled anchor is among them. Please have a look around and feel free to participate in the Fouled Anchor discussion board/forum.